A few weeks ago, Wells Fargo Bank shocked the banking world with news that it had created millions of unauthorized credit card and bank accounts. This past week, revelations emerged that Germany's largest financial institution Deutsche Bank's is in serious financial troubles. Its problems may be so large that they threaten the economic and financial stability of home country Germany. The Brexit news continues its slow but steady drip on the geopolitical landscape. Despite OPEC's best efforts to lift prices for oil, analysts are unconvinced that prices will rise much. 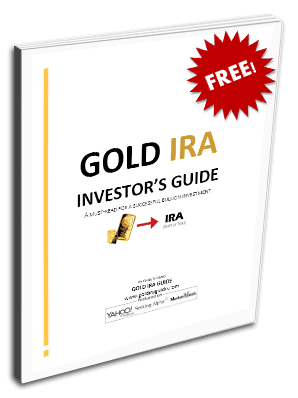 Everywhere you turn, instability argues for keeping your retirement gold holdings. The headlines kept coming last week and over the weekend.”Deutsche Bank denies that CEO John Cryan has asked Merkel for support.” “Deutsche Bank can only be saved by the German government, strategist says.” The man who called Deutsche’s decline has some gloomy predictions on what’ll happen next.” These ominous sounding headlines surround fears that the bank will have to pay as much as $14 billion in order to settle U.S. Justice Department investigations that pertain to mortgage securities. In the latest banking scandal, apparently Deutsche Bank engaged in questionable practices when it sold them ahead of the 2008 financial crisis. The bank already had suffered this year from fears that it was overly exposed to the failing energy sector prices and potentially in a cash flow crunch. The German government refuses to talk about or admit to working on a rescue plan for the largest lender in Germany. Yet Frankfurt research firm DGWA CEO Stefan Müller says that the bank will only be saved from collapse by a “substantial government intervention.” He stated that “Deutsche Bank doesn't realize that something serious needs to happen.” The problem is that Premier Angela Merkel is not in a strong position ahead of next year's elections to put together an unpopular bailout or even a financial aid package. Germans fear this creating a moral hazard scenario where other lenders do not have any motivation to monitor for possible risks because they know that the government will backstop them. Markets Analyst Neil Wilson at ETX Capital wrote in a note this past Wednesday that Deutsche Bank has a problem with not being profitable any longer and with overwhelming costs in fines from and litigation against the U.S. Justice Department. All of this has taken a toll on the stock which has dropped more than 50 percent in 2016 alone. More troublesome is the soaring cost for affected investors to insure their exposure to the bank's debt. Larger hedge funds like (George) Soros Fund Management are building up enormous short sale positions against the bank. As it stands currently, the bank can not afford the $14 billion recommended fine from the U.S. Justice Department. Some are hoping that the bank will be able to negotiate the number substantially down, as it confidently argues. Others believe that the German government will pay the settlement fine. Müller argues that the government will not agree to pay off the fines, instead choosing to backstop a massively restructured financial institution. By guaranteeing its survival they could avert a collapse of a systemically critical bank. MBMG International Managing Partner Paul Gambles thinks it would be miraculous for the largest German bank to absorb the simultaneous blows of a significant multi billion dollar fine, fleeing depositors, derivatives losses, and subsequent asset book deterioration. He is the individual who raised the spectre of a possible collapse of the institution creating aggregate exposure that is greater than the entire governmental resources of Germany. “If Deutsche Bank goes, it would take the German economy, the euro zone banking system, the euro zone economy, the Chinese banking system and the global economy with it, he stated. Gambles also warned ominously that if the finance ministry waits too late to shore up the bank than it will force Germany out of the euro zone. Though Germany fears hyperinflation passionately, such a situation could lead them to massive money printing to try to plug the holes. You can see why this Deutsche Bank situation should be carefully and closely watched for its potentially significant contagion risks. This past week, British Prime Minister Theresa May set a deadline of March to begin the official exit process of the United Kingdom from the European Union. Up to this point, there had been some faint hopes in the market that perhaps the whole process would never really happen. What remains to be seen is whether or not the British experience a hard Brexit which involves a complete break with the single market of the EU. This result could lead to major upheaval as banks tripped over each other in their race to leave London. Some analysts believe that a severe deterioration in British economic data will force the politicians' hands to work towards a softer Brexit. British pound sterling was only half a cent away from a 31 year low against the dollar today on the announcement and rising fear. Gold received a substantial boost as well. OPEC has been busily trumpeting the success of its meeting in Algeria this past Thursday that they will actually cut their oil production in their first show of unity and strength since 2008. According to Reuters, the members of OPEC would hold their production in a 32.5 million to 33 million barrels per day range. Though Goldman Sachs has figured that strict adherence to this target would reduce oil output by between 480,000 and 980,000 barrels per day below their 2017 forecasts, they do not see it adding more than $7 to $10 per barrel to oil prices. Risks to this production estimate include the fact that Iraq and Libya are already over-producing 180,000 barrels each day more than what Goldman anticipates. Societe Generale similarly has weighed in that this agreement will not impact their oil price estimates. They are holding fast on their Brent crude forecasts of $50 per barrel for 2016 Q4 and $60 by 2017 Q4. Analyst Michael Wittner argued that though OPEC is trying to reduce its production by from 500,000 to a million barrels each day, he anticipates a true cut of under 500,000 barrels per day.